Another month another subscription box. Yes! Opening February’s Box From Japan was like being a kid in a candy store, each unboxing feels like Christmas all over again. It truly is a wonderful feeling knowing I’ll surely love every item because they are unique, tasty and authenticly Japanese. I’m proud to call it my guilty pleasure! Could a foodie ask for more? What is Box from Japan? 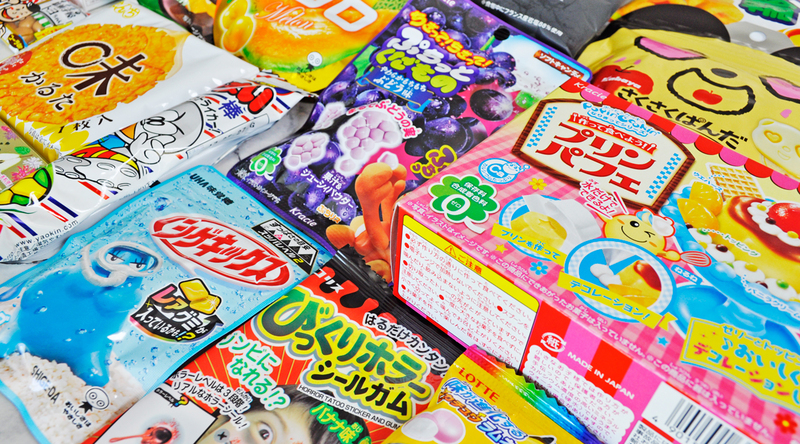 It is one of the best Japanese Snack subscription boxes that contains some of the most irresistibly delicious treats delivered straight to your door. Why Box from Japan? They offer the Biggest Box in the Internet! From 17 to 20 different sweets every month! They also have Direct access to the largest suppliers of Candies in Japan guaranteeing the newest and most original treats for you. DIY – Popin Cookin – $29 – 4 Different Japanese DIY. Pocky Box – $25.99 – 4 Original Japanese Pocky. Iwako – $13 – 1 Set with 7 collectible erasers on average. Pokemon Box 1 – $39.99 – 5 exclusive items from Pokemon Center (Includes an original Pikachu, Pikachu Gummy, Pokemon Moscatel Jelly, Chocolate Snacks, Ramen Pokemon. Pokemon Box 2 – $33.99 – 8 original items from Pokemon Center (Includes Pokemon Ramen, Pokemon Card Game Gummy, Daisuki! -Pikachu-Gummy, Pokemon Card Gum, Pokemon Curry, Pokemon Moscatel Jelly, Pokemon Ramune, Chocolate Snack Pokemon. All prices include free shipment worldwide and payments can be made through PayPal or any credit card. Once your order has been processed and heading your way, you will receive an email with a content sheet in the form of a pdf attachment which is a helpful guide detailing the list of treats in your box. Sweet tasty chocolates in the shape of Anpanman characters. They contain tooth-friendly green tea polyphenols which help me feel less guilty about eating them all in one sitting. This unique and rich strawberry flavoured KitKat is a must try! It smells like strawberry, tastes refreshing with a hint of acidity. Hope it’s not a limited edition item because it should be a keeper! These crunchy soft potato puff rings are rich in cheesy goodness and they taste delicious. Each little sour, soda flavoured gumdrop packed a punch and it was probably one of my favourite items in the box. This long delicious stick is light in texture and rich in flavor making it the perfect snack for on the go! I’m seriously getting hungry thinking about how good this sweet fried rice crackers tasted. These candy balls change from strawberry to two different types of melon, depending on how you eat them. Melt them in your mouth to get the strawberry to melon taste or bite into it for the strawberry flavour to change to watermelon. These gummies may not be for the squeamish. They have a unique look and jelly-like texture, made with the fruit juice of real melons and also containing hemp seeds. These vanilla Daifuku flavored balls had a mouthwatering chewy center that made them extremely moreish! These were my numero uno! They may look like any old potato chip but the flavour is unreal. Made with thick, wave-cut Hokkaido potatoes, rock salt from France, and mushroom extract as their hidden flavor. Why? Because you’re worth it! Yummy smiling panda faces in the form of an apple custard cookie, this 20-year anniversary product for Saku Saku Panda is limited edition so get them while they’re hot! I really wish this bag of refreshing cola candy came in a bigger packet, they were soft in texture and rich in flavour. I don’t think I’ll ever be too old for special effects temporary tattoos, these will come in handy for Halloween! I’m a sucker for any fruit coated in chocolate, these orange chocolate bites tasted divine! Asahi you don’t only make good beer, you nailed this one right on the head! These soft candy grapes come in bunches, they taste great and are lots of fun to pull apart and eat. I love the unique combination of floral aroma mixed with pear flavour, the shell is crisp and easy to chew. Each piece is individually wrapped and I look forward to trying their other flavours. This has been one of the tastiest Do-It-Yourself candy making kits I have ever made. These are some photos of the fun I had making it. They are so much fun and tasty too! That looks amazing ! I love weird food, especially if it’s from Japan 😋🇯🇵 Great post ! strawberry kitkat sounds so good! Thanks Cat, you are awesome! What a cool idea – I’ve seen people do this with American food as well. Hope you enjoy! My mouth is watering!!!! They all look delicious! I know! Right? So good! Hmm Strawberry Kit Kat! I’ve seen various flavours of Kit Kat in Asian markets around here including green tea. I’ll keep an eye out for the Strawberry one. And omg… DIY pudding parfait! Combining my 2 favourite things: DIY and candy! If you love these cute little boxes you should definitely check out Emmy Made in Japan on Youtube – she features loads of different fold related stuff but does LOADS of videos about japanese sweets and snacks. Her videos on the Popin Cookin products make them seem so fun and cool! This is awesome. I have to try them! Please do! They are amazing!